I give up. Between Windows 8 and Windows 10 and Microsoft's privacy debacle, I'm done. What do you think if I convert to Linux, or am I wasting my time? What applications and utilities are compatible, i.e. browsers, anti spyware, virus protection etc. How would you go about setting the computer up. I have moderate experience, utilizing forums and sites like yours when encountering major problems. Linux is a great way to extend the life of older computers, simply because the resource requirements of many Linux distributions are so much less than those of Windows. And, of late, I'm hearing from people who, like you, are frustrated with Microsoft and Windows and are hoping for alternatives. Linux isn't for everyone, but it can be a solid alternative. However, we need to set some expectations, and of course there are also a few "gotcha's" along the way. Continue Reading: Should I convert to Linux? There are hundreds, if not thousands, of technical support sites on the internet. If you search for various problem-related terms, you'll stumble across many of them. Some are good, some … not so much. Since I regularly get many more questions than I can possibly answer, I thought I'd share the results. 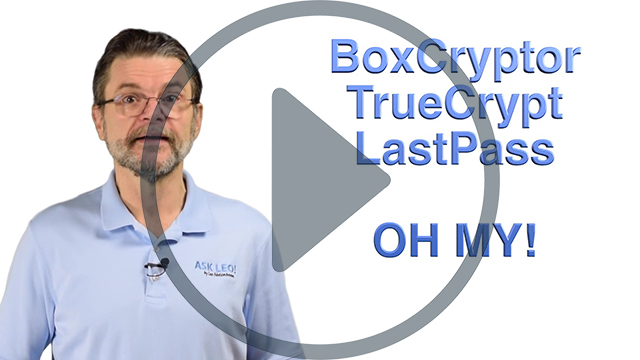 Continue Reading: BoxCryptor, TrueCrypt, LastPass ... Oh My! A reboot is the process of shutting down all running software on a machine, including the operating system itself, and then immediately reloading as if the machine had just been powered on. A reboot differs from actually powering down the machine and turning it back on only in that the power is never turned off. The software simply acts as if the computer was shutting down completely, and then immediately acts as if it had just been powered on. Reboots are common debugging and system-stabilization techniques, as they force the entire system back to a known initial state. (A power-off shutdown also includes resetting the hardware to a known initial state as well.) 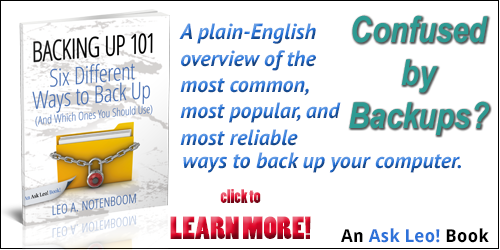 More information: Why do so many tech support solutions start with "reboot" or "turn it off"? Thank you Leo for the informative article and video which hit the nail on the head for me. I am 70 and have worked my way up being self taught with computers since Win 3. I had broken my leg whilst out walking my Cavalier King Charles Spaniels. Bored of daytime TV I decided to use my son's old computer he had left behind when he moved from the UK to the US. I help others to use computers and laptops, but I recently hit a block and thought to myself I am old now and cannot do this anymore. I recently bought a tablet and for the life of me cannot get my head round it..... Go figure.........thanks to your inspiring video you convinced me I am not too old to use it. Learning curve ahead and thanks for giving me the proverbial kick up the backside. Keep up the good work Leo and bless you. "The laptop on your desk, the desktop computer, whatever, it's a window into a larger world that I really, really want you all to be able to partake in. " is a sentence I use in every class. Today's Internet brings the world into my home. I can do research, check the latest news, stay up to date with sports teams and I can also, thanks to YouTube, listen to music, watch uploaded concerts, and even chuckle at the "Who's on First" skit. Some of today's seniors need to shake of the fear of computers. The computer, like cars, is much more dependable and stable. My Windows 8 computer has not crashed since I bought it and even if it does, a good backup always sits on my shelf. Again, thanks for emphasizing that your are never too old to learn if you keep your mind open. Boy, I must be the youngster in this list as I hit 68 day after tomorrow. My wife will be 70 next March and you have never seen anybody who can order orchids faster on line. Let's not even talk about eBay. My mother keeps her iPad going at 94 with Skype to my sister in Italy and keeping herself sharp playing bridge. She has picked up a few new tricks and now she really is the Bridge Shark!! You are 101% correct in saying "you are as young as you feel" or something to that effect. retired from my job but still active with new technology being offered on the web. from your site and will never stop reading your article every day. Leo, WRT waiting for the 100 year old, my 100.5 year old uncle just started using a computer to do email and web browsing (well actually an iPad). Now he's doing Facetime with his grandkids. He is the most technically averse person I know. If he can do it, anyone can. They just have to try.